You have at your disposal two types of networks Wi-Fi (2.4 GHz b/g/n and 5GHz a/n/ac). Both networks have a common name: Numericable-abcd. These two networks can be configured and used independently. You can disable or enable your convenience your Wi-Fi networks. internet TV still works - indicating that it's not a problem with the router's external connection. Also - I only seem to get a 25-30m wifi range - which seems low (at least for a 2.4GHz system). Is my model of macbook pro able to switch seamlessly between frequencies on the same network - or would I get better performance by turning one network off (or using different network names) ? Could the wifi chip become 'confused' by having parallel networks - and could it be what's causing the loss of connection and/or lack of wifi range ? The short answer is YES it is capable. I have a Macbook Pro 13" Retina Late 2013 model running El Capitan. 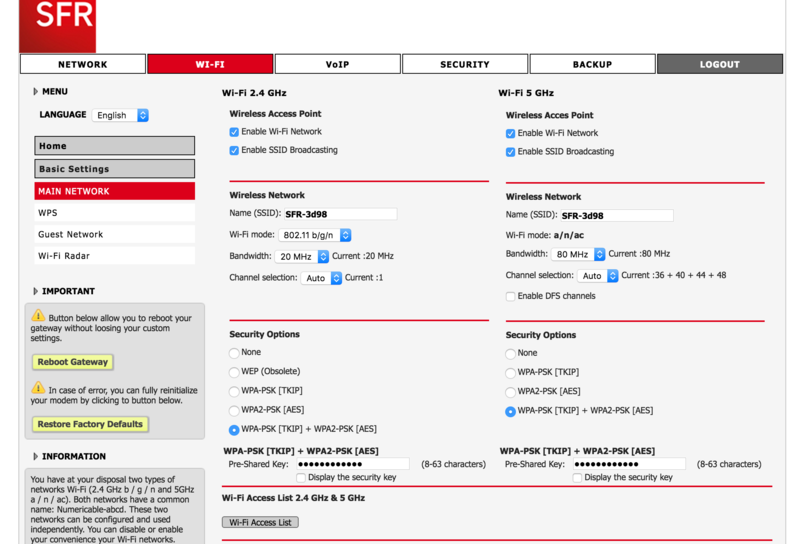 I am running a Dual Band Router 2.4 and 5.0 by ASUS. The difference of my setup is that I gave the 2.4 and 5.0 different names so they appear separately in my wifi list. I have it set to access the 5.0 first and if for some reason it is not available it will connect to the 2.4 band. I have it set the same on my iPhone, iPad as well. I have not experienced any connectivity problems and the range is quite good. Have you tried setting each band with a separate SSID? PW can be the same if you want. Actually I have even a guest SSID setup too and it too works just fine. Chances are, it's your WiFi router. I was having the exact same issue with 2 Macs (iMac 27 Late 2012 and a 2009 MBP) as well as a Microsoft Surface Pro 3. I had both 2.4GHz and 5GHz networks and would get random, but continual dropouts that would lose Internet connectivity. What I found was that the build quality of even the so-called best routers (Netgear, D-Link, Asus, etc.) were still of poor quality. I ended up getting an "Enterprise Grade" wireless access point - the Ubiquiti UAP-AC - did my problems go away. When I say, go away, I mean go away instantly. From the time I installed this WAP, I have yet to have an Internet drop out. Period. I haven't had a single one in the month and a half I have had it installed. The fix was instantaneous. If you do go this route, what you will have to do is turn off the WiFi on your router and just use this external WAP. Installation was super easy - it took about 10-15 mins total and I had my network up and running in no time. Not the answer you're looking for? Browse other questions tagged macbook network wifi . iPhone connects to public Wi-Fi but Mac doesn't - why?